Family Experiences - "An Ecology Experience That Is Simple, Pure and Natural!" WE LOVE AND ADORE FAMILIES! 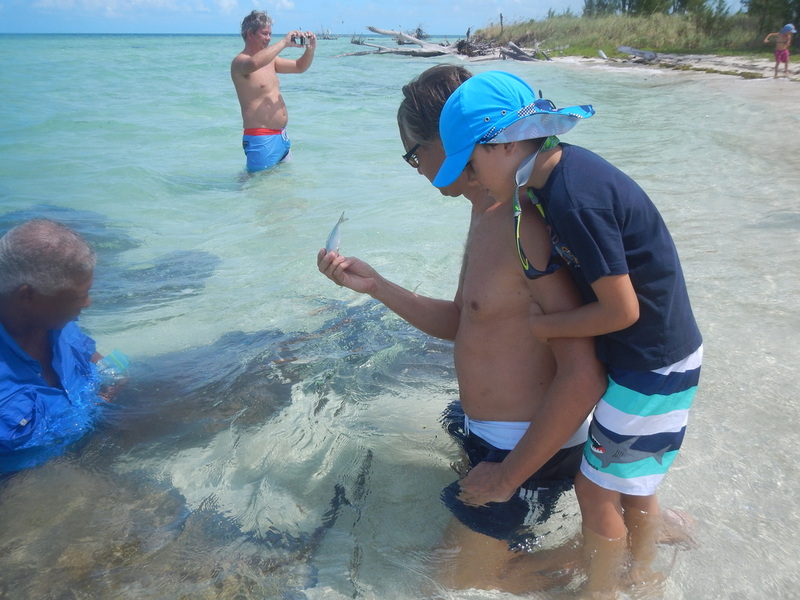 This page will be filled with stories and images of eco-families including, grandparents, parents, and their children interacting with Stingray's and Nature at Sandy Cay; Snorkeling in The Beautiful Reefs and Boat Wreck off West End, Grand Bahama Island! A customized family ecology tour is the perfect way for the entire family to share their love of nature. Complete the form below with your selection of snorkel, fishing, and stingray options to create the perfect eco-family experience. Book your family eco-tour today! My day with Captain Cooper was amazing. I went with my Nanny and Papaw and my friend Aiden and his Nanna. 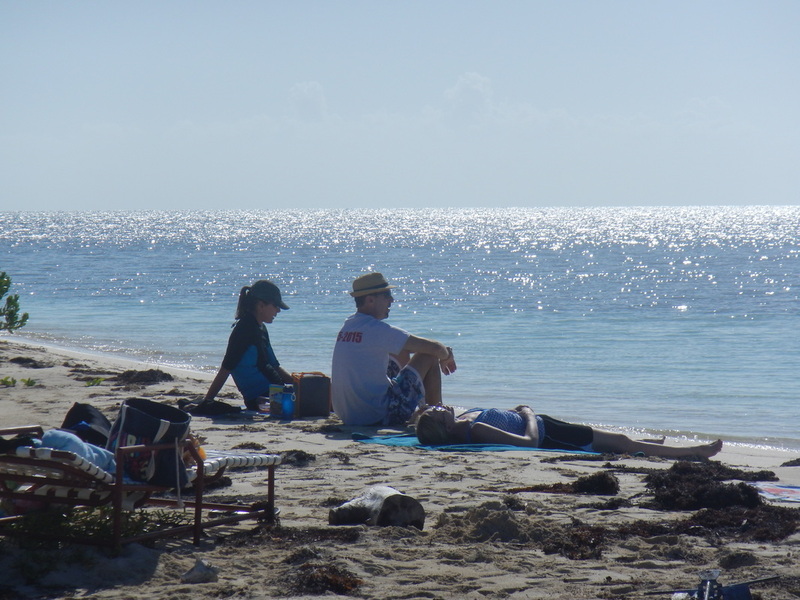 We drove to the west end of Grand Bahama Island to Old Bahama Bay. We met Captain Cooper in his truck and drove to his boat, The Boat of Ely. We all got aboard. Before we left Captain Cooper cut up some fish for the stingrays to eat. We went to Sandy Cay. We passed Indian Cay and Wood Cay. The boat ride was fun and we went super fast. 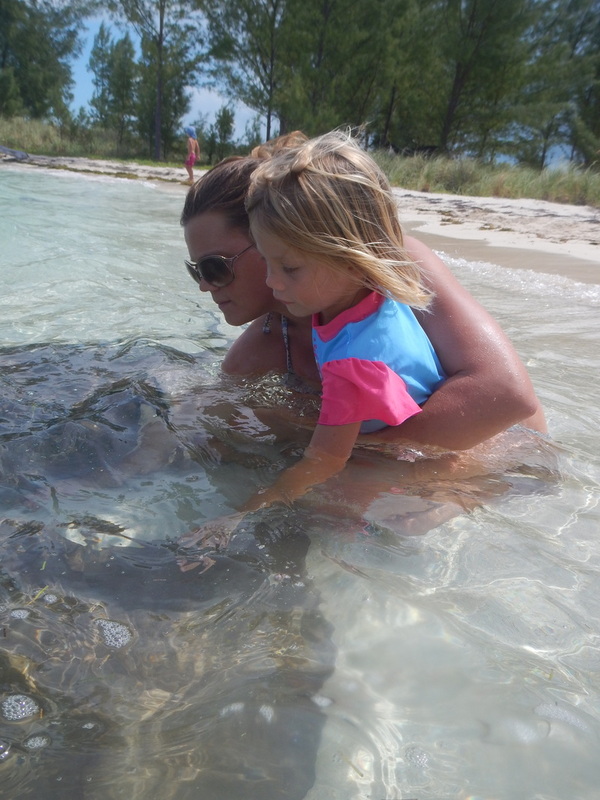 When we got to Sandy Cay Captain Cooper showed us how to feed and pet the stingrays. He made us all feel comfortable in the water with the stingrays. He told us that they only sting when they are threatened. He fed them and I got to feed one too. After that we went snorkeling with the sting rays and Captain Cooper shot videos of us interacting with them. That was one of the funnest things I ‘ve ever done. Next we got back on the boat and went to a ship wreck. Captain Cooper told us that it went down in a bad storm before he was born. One of the saddest things about it was that so many people had died and they were so close to land. We could see Sandy Cay from the wreck site. We got in the water and snorkeled around the wreck. There were so many fish. I saw a huge puffer fish under the engine. There were two huge black and white striped angel fish that looked like zebras, a sea urchin that was on top of the engine and a shoe that might have belonged to someone that was on the boat. The shoe was huge. I saw a ginormous conch shell too. I see why Captain Cooper said that this was going to be the best day of my life. He was right. I learned a lot about stingrays and the shipwreck. I also learned not to put my hands in the water when interacting with them because they might think it is a fish. We learned about protecting the ocean environment and picked up a balloon that was floating on the water and could have caused a problem for a sea turtle or fish. I think it would be amazing to have a job like Captain Cooper has. Maybe one day I can do the same thing. That would be awesome. When we got back to Old Bahama Bay the sun was setting and it was so pretty. We saw a lot of people fishing with hand lines and they were catching a lot fish from the rocks. We got off the boat and Captain Cooper cleaned his boat while we packed our stuff in the car. We said goodbye and gave him a hug. I hope one day we can go again with him and go to some of the other places that he told us about and go fishing. 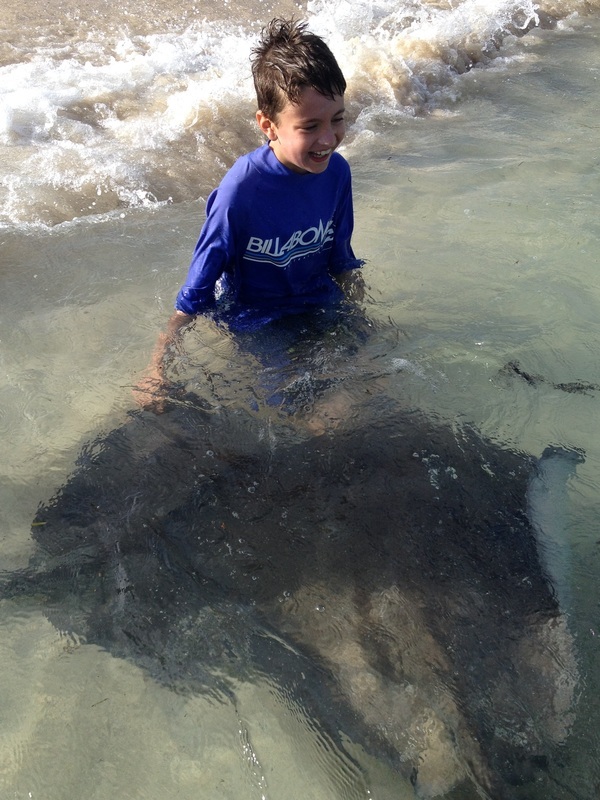 I am so happy I got to meet Captain Cooper and the stingrays at Sandy Cay. We started our trip driving to Old Bahama Bay. We meet Mr. Cooper at the gate. We drove to Mr. Cooper’s boat. We gathered all our things and took them to dock before getting on the boat. Mr. Cooper taught us about our safety. He explained to us how to get on the boat and where to stand while everyone got on. Once we were all on the boat, I helped Mr. Cooper cut up the fish by holding the bag. We all took our seats and started our boat ride to Sandy Cay. Mr. Cooper was very nice. We passed Indian Cay and Wood Cay on the ride. We also passed two boats of conch divers. Dane helped Mr. Cooper drop the anchor on Sandy Cay. We sat on the boat and watched Mr. Cooper interact with the stingrays. He explained to us what to do to be safe. He gave "Hugger" a kiss and showed us what their mouths look like. He showed us how to hold the fish when we would get the chance to feed them. We got out of the boat and stood near the shore in a line. He showed us how to pet them. Then we put our hand in the water. The stingrays swam around our feet and we got to touch them. Then one at a time we knelt in the sand in front of Mr. Cooper and he helped us feed them. I liked doing this, it was awesome. Next, we all put on our snorkel gear. We swam with the stingrays and Mr. Cooper videotaped us with his GO-PRO. 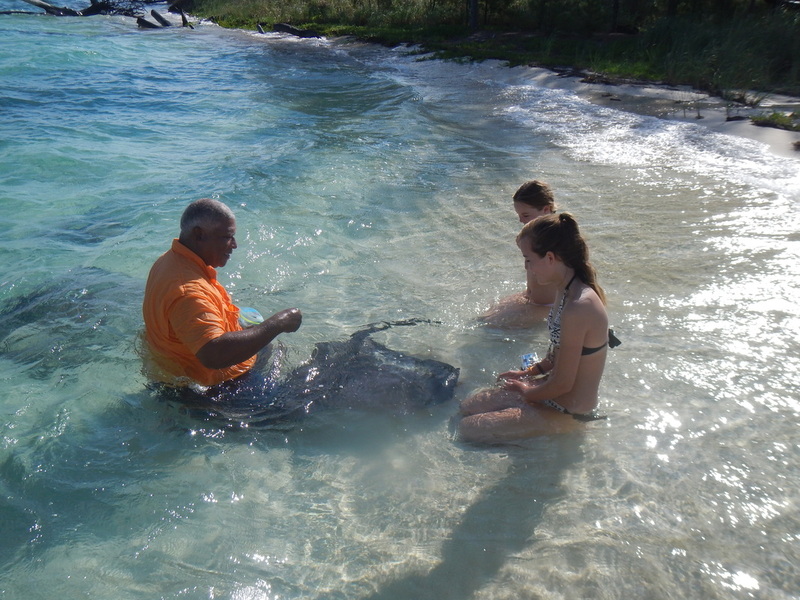 Last thing we did with the stingrays, was we each feed them fish by ourselves. I felt very good, it was a once in a lifetime moment. We all got back on the boat. Dane pulled the anchor and we were on to our next stop. We rode the boat for a short distant away from Sandy Cay. Mr. Cooper pointed out the wrecked ship below us. Dane anchored the boat. We put on our snorkel gear and jumped in the water. I saw a lobster, fish eggs, a shoe, dozens of fish and the boat. We also saw a barracuda, I was not even scared. When Lori told us it was time to go in, I felt sad. I was having so much fun. We got back on the boat. Mr. Cooper made each of us a bowl of fruit and we started our ride back to Grand Bahama Island. Dane pulled a balloon out of the water because it could hurt the animals. We saw a sea turtle and enjoyed the ride. ​When we got back to the dock we unloaded our stuff. We told Mr. Cooper good-bye and gave him a hug. I told him I would be back in 10 years, because I want to come work for him when I turn 18. I want to give Mr. Cooper 1,000 stars. But I can only give him 5. I had such a great time. One of the best days of my life. 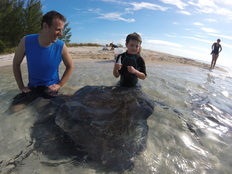 Our Day With The Stingrays at Sandy Cay! Hello, my name is Tristan. I am 9 years old and I like animals a lot. We went on a boat ride with Capt. Keith. 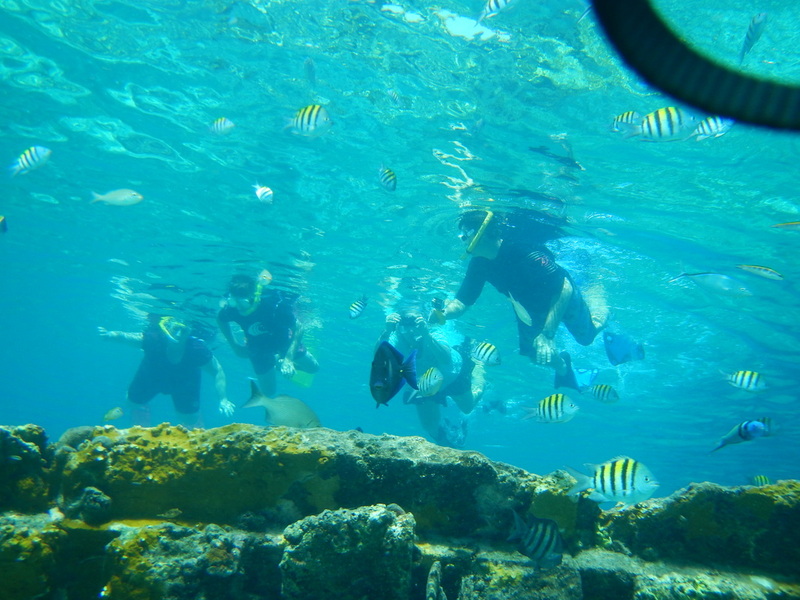 We were pulled a long a reef snorkeling and we saw a lot of fish. Then we went to a shipwreck and we saw a lot more fish. I saw a lion fish while we were there and lots of other fish. Then we went to an island to feed stingrays. When it was my turn to feed the sting rays, I was a little nervous because the barbs on their tails are more deadly than a shark bite. But I wasn’t afraid after a while because they weren’t trying to sting me and Capt. Keith told me that they weren’t going to use their barbs. The stingrays back felt rough but their fins were smooth. When we got to see them from underwater I saw a remora on the bottom of one of their tails. We fed the stingrays fish and Capt. Keith helped me. I liked feeding the stingrays. On our way to the island from the shipwreck, we saw a pelican. I also saw it on the island. I saw some heron foot prints on the beach and some crabs. I saw minnows in the water and nurse sharks. I think I saw a tern. After we fed the stingrays, we went to their napping spot by snorkeling. I learned that stingrays can blow out sand from a hole behind their eye to cover them. I saw some young barracuda and a conch shell. We also saw two young Caribbean reef sharks. We were about to leave the island on the boat when we saw an osprey with a fish in it’s talons. On the way back we saw two cormorants. At the harbor we saw a great blue heron, he was waiting for leftover fish. I dropped 2 on the concrete and he came and got them one by one. It was a fun day, and one that I will never forget. You should try it sometime. Hello, my name is Evelyn and I am 7 years old. 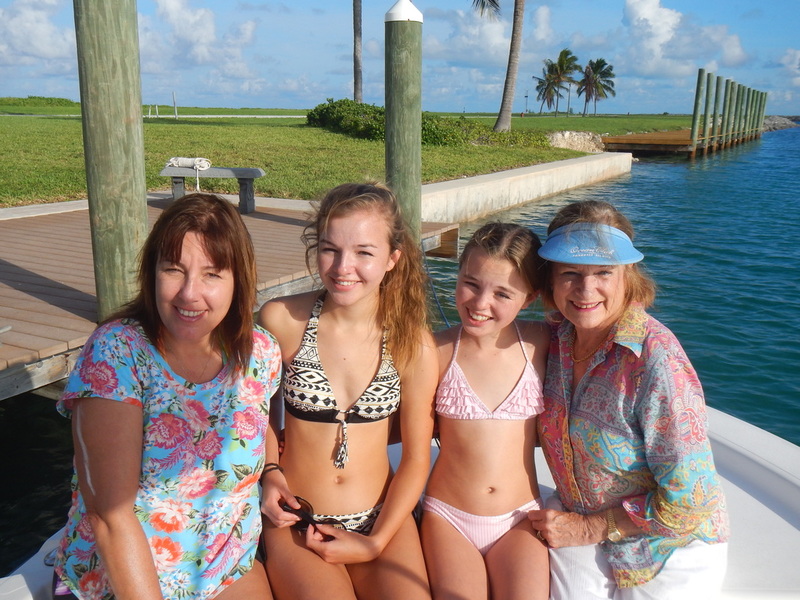 We went for a boat ride in the Bahamas. We went snorkeling at a coral reef. We saw lots of fish. I saw black fish with blue and black fish with yellow. And I even saw purple fish. We went snorkeling also at a shipwreck. I saw a puffer fish and lots of yellow fish. Next, we saw stingrays and we got to feed them. I wasn’t scared and they liked me a lot. They felt smooth. We went to go snorkeling to see what they look like underwater. I could see their mouth and eyes. One time a whole bunch of them crowded me and I petted all of them at the same time. Then we swam to a deeper part and I saw lots of stingrays again. And I saw reef sharks. They were scared of me. It was a really fun day. I liked Capt. Keith. I hope you can do the same things as me sometime. Eco-Family Tour prices are based on the following group rate for 2 to 5 persons - Full Day $799 | Half Day $599. Choose from the drop down menu options below - 1. Stingray Tour, 2. Fishing or 3. Snorkel. To book the Eco-Family Tour Click on the drop down menu below to select the payment options. Please provide the following information: Select from each button section the item that best applies. 1. Date you wish to feed the rays! 2. Number of guests and ages of children. 3. Hotel or residence on Grand Bahama. 4. Cell or home phone number. 5. Will you rent a car during your stay or require pickup? 6. Please let us know your preferred eco-program i.e., half or full day, birding, snorkel, boat wreck, fishing and stingrays! Thank you!